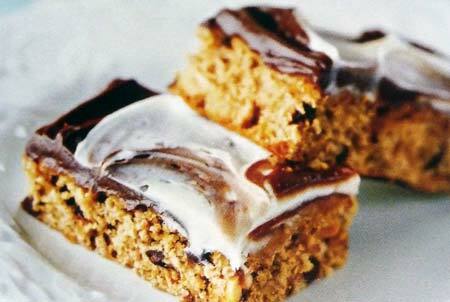 I have a soft spot for old-fashioned tried and true recipes like this Banana Bar Recipe. They tend to be simple without a lot of fancy ingredients. While I love to bake, I don't love running around to specialty markets hunting for exotic items I'll probably use only once. With baking, as with life, my motto is to keep it simple. I'm also a banana lover with a propensity for banana-flavored baked treats - banana bread, banana cookies, banana cake, banana muffins. There's something so homey and comforting about them. This Banana Bar recipe comes from one of my favorite cookbooks, Sylvia's Cakes & Breads: Famous Recipes from a Small Maine Kitchen by Sylvia Adams Hocking, who ran a small bake-shop and mail-order business from her home in Maine. One of her most famous customers was Julie Andrews, who wrote the book's foreword. It's full of old-fashioned recipes for home-style baked goods that are delicious and comforting. Now out of print, this book is one of my treasures. In her book, Sylvia introduces these Banana Cookie Bars by saying, "Packed in pretty tins, these make a nice holiday gift." I don't know about you, but it's been way too long since I received a tin of homemade cookies or bars at the holidays. I hope to resurrect the tradition this holiday season, beginning with Sylvia's Banana Bars! 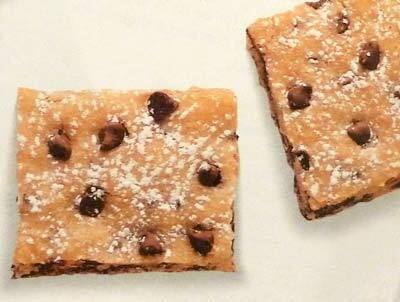 You won't believe how easy these homemade bars are to make. Just stir the batter together in a single bowl and spread it in a pan before baking. You can dust your banana bars with confectioner's sugar or spread them with a simple creamy vanilla frosting to make them extra special. They make a great dessert and would be nice as a thoughtful hostess gift too. Remember to completely read the entire recipe and gather all your ingredients on the counter before beginning to bake. It can save you the frustration of realizing that you are missing a key ingredient midstream. These Banana Cookie Bars will taste best when you use very ripe bananas! Preheat your oven to 350F degrees. Lightly grease and flour a 9x13-inch baking pan. In a large mixing bowl whisk together the flour, sugar, baking soda, salt, and cinnamon. Add the bananas, pineapple with its juice, eggs, oil, and vanilla and stir until the mixture is well blended. Stir in the cherries until they are incorporated throughout the batter. Pour the batter into the prepared baking pan, spreading it out evenly. Once your banana cookie bars have cooled you can sprinkle them with confectioners sugar or spread them with vanilla frosting. Cut into desired size bars—small, medium or super-sized—it's your choice. This recipe makes one 9 x 13-inch pan of Banana Cookie Bars. In a medium saucepan, heat 1/4 cup butter with 3 to 4 tablespoons of milk until the butter melts. Remove from the heat and stir in 3 cups confectioner's sugar and 1 teaspoon vanilla. Stir with a spoon or whisk until smooth. This Banana Bar Recipe is adapted from Sylvia's Cakes & Breads: Famous Recipes from a Small Maine Kitchen by Sylvia Hocking. Banana Nut Bars: Stir in 1 cup chopped walnuts instead of the maraschino cherries and bake as directed. Pineapple Banana Coconut Bars: Stir in 1 cup coconut instead of the cherries and bake as directed. Preheat your oven to 350F degrees. Lightly grease a 9x13-inch baking pan. In a large bowl mix sugar, bananas, oil and eggs with a spoon. Stir in flour, baking powder, baking soda, cinnamon and salt. 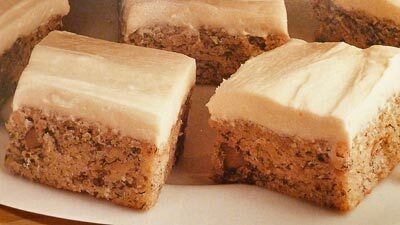 Once your banana nut cookie bars have cooled you can frost them with Cream Cheese Frosting. In a medium bowl, mix cream cheese, butter and vanilla. Gradually beat in powdered sugar with spoon until smooth and spreadable. This recipe makes one 9x13-inch pan of Banana Nut Cookie Bars. Bananas, peanut butter and chocolate make an outstanding flavor combination in this easy cookie bar recipe that begins with packaged peanut butter cookie dough! In a large zip-lock resealable plastic bag, combine cookie dough, oats, banana, chocolate chips and peanuts; seal the bag. Using your hands, squeeze and knead dough mixture together in the bag until combined. Remove cookie dough from bag and pat evenly into prepared baking pan. Bake about 25 minutes or until bars are golden brown. Remove from oven and place pan on wire rack to cool completely. Frost bars with desired frosting or use one-half can chocolate frosting and one-half can vanilla frosting and swirl frostings together on top of bars. Preheat oven to 350F degrees. Lightly grease a 15x10-inch jelly-roll pan and set aside. In a medium mixing bowl, stir together flour, baking powder and salt. In a large mixing bowl, beat together butter, granulated sugar, brown sugar and vanilla until creamy. Beat in bananas and egg. Slowly beat in dry flour mixture just until combined. Spread batter into prepared jelly-roll pan. Bake about 20 to 30 minutes or until wooden toothpick insderted in center comes out clean. Remove from oven and cool pan completely on wire rack. Sprinkle cooled banana bars with powdered sugar. This recipe makes one 15x10-inch jelly-roll pan of Banana Chocolate Chip Bars.